Social Innovation Dialogue is a way of talking and listening with one another that addresses tough problems, reveals shared meaning and purpose, and invites new possibilities to emerge. The dialogue process is different from most meeting styles that are based on discussion or debate ... and it asks us to grow new skills in the art of conversation. This dialogue process draws upon the practical experience and explorations, over the last decade, by the Stewardship Learning Community, the New Zealand Social Entrepreneur Fellowship, and the network of Changemakers 5-10-5-10 community groups. 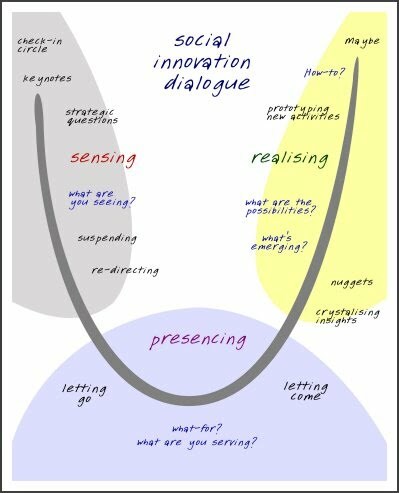 The approach to dialogue has been heavily influenced by the physicist David Bohm, and the work of Linda Ellinor and Glenna Gerard, Peter Senge and William Isaacs. Framing the dialogue in the allegory of the "U" process, has been influenced by the work of Adam Kahane, Otto Scharmer, and Zaid Hassan. The strategic question insights have developed upon the work of Fran Peavey and Peter Block. The chart (below) comparing debate and dialogue is adapted from material prepared by the Dialogue Group of the Boston Chapter of Educators for Social Responsibility (ESR). is oppositional: two sides oppose each other and attempt to prove each other wrong. is collaborative: two or more sides work together toward common understanding. finding common ground is the goal. participants tend to speak representing a group with a specific opinion. participants speak as individuals about their own unique experiences and uncertainties. one listens to the other side in order to find flaws and to counter its arguments. one listens to the other side(s) in order to understand, find meaning and find agreement. atmosphere is often threatening, confrontations and interruptions are expected. atmosphere is one of safety, and promotes a respectful exchange. affirms a participant’s own point of view. enlarges and possibly changes a participants point of view. causes critique of the other position. causes introspection on ones own position. participants listen to refute other ideas, and questions are often rhetorical challenges or disguised statements. participants listen to understand, and questions are to gain insight into the understandings of others. defends one’s own positions as the best solution and excludes other solutions. opens the possibility of reaching a better solution than any of the original solutions. creates a closed-minded attitude, a determination to be right. creates an open-minded attitude, an openness to being wrong and an openness to change. submits one’s best thinking and defends it against challenge to show that it is right. submits ones best thinking, knowing that other people’s reflections will help improve it rather than destroy it. calls for investing wholeheartedly in one’s beliefs. calls for temporarily suspending one’s beliefs. searches for glaring differences, and flaws and weaknesses in the other position. searches for basic agreements, and strengths in the other positions. counters other viewpoints without focusing on feelings or relationship and often belittling or deprecating the other person. involves a real concern for the other person and seeks to not alienate or offend. statements are often predictable and reveal little new information. new information and insight emerges. success requires simple impassionate statements. success requires exploration of the complexities of the issue being discussed. assumes that there is a right answer and that someone has it. assumes that many people have pieces of the answer and that together they can put them into a workable solution.